Ambughar Fort. 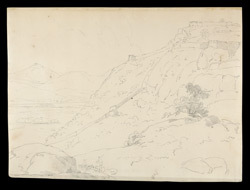 20 April 1792.
bl.uk > Online Gallery Home	> Online exhibitions	> Asia, Pacific and Africa Collections	> Ambughar Fort. 20 April 1792. Ambur is a town in the Vellore region of Tamil Nadu, situated on the south bank of the Palar River at the foot of the Kadapanattam pass leading into Salem. The fort is almost inaccessible, towering above the town and has been the scene of severe fighting many times as it occupies a strategic position commanding an important pass into the Carnatic. In 1749 the first pitched battle of the long wars of the Carnatic was fought under its walls when Anwar-ud-din, the Nawab of Arcot was defeated by Muzaffar Jang.